With the development and production of their RAM Trucks based products and turn-key vehicle conversions, American Expedition Vehicles (AEV) has taken direct aim at growing market for full-sized trucks. Specifically, where outdoorsmen and overlanders needed a highly-capable truck to access the backcountry, haul gear, and tow on the weekend. The kicker? The majority of this segment uses their trucks for work more than for play—be it a 30-mile daily commute or hauling materials and equipment between jobsites. The most discerning in the “work hard, play hard” full-sized trucks category demand that capability-based upgrades don’t negatively affect OEM performance, payload, handling, or comfort. After releasing their heavy-duty RAM Trucks parts line and Prospector build in 2013, AEV spared no time in returning to the drawing board to design, test, and develop a suspension system and other equipment upgrades for the RAM 1500. Gila Legends Expedition: Last May, I guided American Expedition Vehicles on a multi-day overland traverse of the Gila National Forest following New Mexico Backroads’ (NMBR’s) daunting Gila Legends Expedition route. Road types and conditions included washboards, two tracks, primitive non-maintained, logging trails, mountain shelf, dirt byway and (least of all) pavement. The trip would serve as one of the first big adventures and tests for AEV’s newest turn-key conversion—the Recruit. As the younger brother to the Prospector (AEV’s heavy-duty RAM Truck vehicle conversion), the Recruit is based on the widely popular 2013+ RAM 1500 platform. As the owner of a 2500 Power Wagon Prospector, I made it a priority to get drive time in the new Recruit for a candid comparison and review. Half-Ton or Heavy-Duty: When walking the endless rows of trucks on dealer lots, buyers must ask themselves what their “truck goals” are. How does a full-sized truck support their lifestyle for both professional and recreational uses? Sure, the 2500 Power Wagon or Cummins equipped 3500 Mega Cab are desirable trucks, but the heavy-hitters are not practical for every single overlander, weekend warrior, or professional. The curb weight difference between a RAM 1500 and RAM 3500, with identical cab and bed configurations, can approach a few thousand pounds. Additionally, half-ton RAM Trucks (when compared to their brawny siblings) boast better overall fuel economy, lower sales pricing, lower maintenance costs, and a fuel-efficient EcoDiesel option. On a side note, a 2018 RAM 1500 equipped with the EcoDiesel engine and optional 32-gallon fuel tank is capable of obtaining 750-miles between fill-ups. Despite this figure being based on conservative highway driving, a 30% or 40% decrease in gas mileage efficiency (often seen with off-pavement driving) could yield around 500-miles of range with the example configuration. While the Toyota Tacoma has been one of the most popular trucks amongst the outdoor aficionados and overland enthusiasts for years, half ton trucks, such as the RAM 1500, are quickly gaining ground. 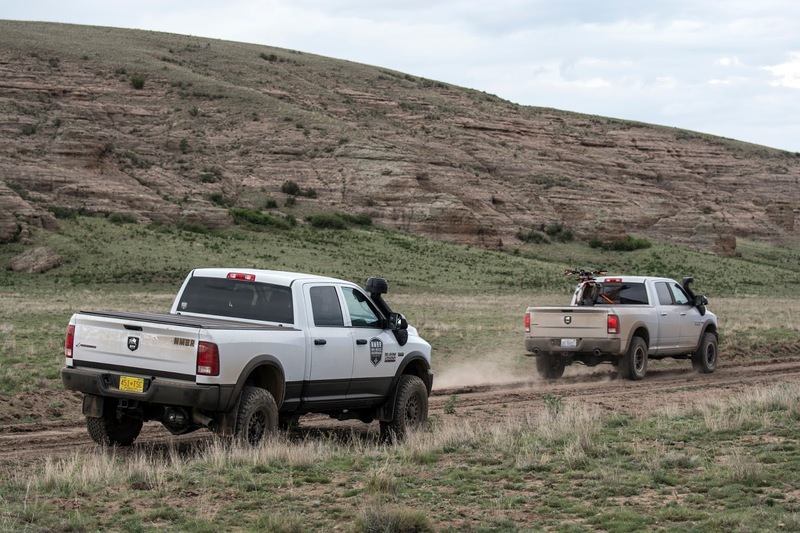 AEV Recruit Test Drive: On the second day guiding the Gila Legends Expedition, I swapped the NMBR Prospector for American Expedition Vehicles’ freshly built RAM 1500 Recruit. The test subject RAM 1500’s platform was a Big Horn edition featuring a 395-horsepower 5.7L Hemi engine, 4-door crew cab configuration (seating for six), and a 6'4" bed. The AEV upgrades on the truck included a stamped steel front bumper, 10,000-pound Warn winch, vented hood, 4-inch suspension lift, raised air intake/filtration system, and 35-inch tires mounted to 18-inch alloy wheels. Typical of AEV’s standards, the design, fit, and finish of the Recruit’s parts was excellent. My extended test drive began on the tight, rocky, and rutted trails of the Elk Mountains, and concluded on the groomed dirt-highways of the Plains of San Augustin. Over rough trail sections, at low to moderate speeds, the RAM 1500’s DualSport suspension was plush yet responsive. The AEV tuned Bilstein 5100 and OEM coils paired nicely over a variety of terrain. The 5100’s dampening characteristics shined through slalomed trail sections where sway response was minimized, and high-speed cornering where stability barred excessive body-roll. Over graded road sections, where moderate to high speeds were obtainable, the Recruit was ultra-smooth and confidence inspiring. I had to let off the throttle when a quick glance down at the speedometer revealed I was traveling in excess of 55MPH along the hardpacked bi-way. Despite the generous amount of provisions and gear loaded in the truck’s backseat and bed, the suspension cycled fluidly. Bump-stop contact was scant through some of the biggest whoops and the truck remained agile through nearly every twist and turn in the road. Crossing multiple deep ruts and washouts at various angles provided an impressive display of the Recruit’s available articulation. The independent front suspension allowed a surprising amount of droop that kept the front tires, for the most part, in contact with the ground and helped to maximize traction. The rear suspension was on par with the 2500's coil over axle set-up yielding ample flex and zero drama in off-camber (or tippy) situations. Although the Recruit rides about six inches taller than a stock RAM 1500, it does not have the approach, break-over and departure angles of the AEV’s heavy-duty trucks. This was noticeable on deep track road sections and under-cut dry creek crossings where the Recruit’s front bumper and trailer hitch made slight ground contact while the Prospector and Prospector XL did not. In some of the tightest sections, where careful negotiation between ponderosa trees was required to avoid body damage, the truck’s steering response was precise and predictable. When compared with the steering response of the 2500’s solid front axle’s linkage style steering system, the 1500’s rack and pinion steering system requires slightly less driver input. On groomed dirt [road] sections, the RAM 1500 tracked well. Washboard surface conditions resulted in minimal bump-steer; an IFS benefit. A long-term test of the Recruit would be needed to provide insight into the longevity of the RAM 1500's steering system and linkage longevity when paired with 35-inch tires and a few thousand miles of rough terrain travels. While AEV offers a base 20-inch alloy wheel for the Recruit turn-key build, the test truck sported their 18-inch Moab wheels paired with 35-inch BFGoodrich KO2 tires. This wheel and tire combination provides greatly enhanced ride quality and traction benefits over the stock RAM 1500 20-inch wheel and 31-inch tire setup. The 18-inch Mesa wheel allows for the use of a bigger tire with a taller sidewall—a strong benefit for off-pavement driving. A smaller diameter wheel paired with a larger tire, provides greater sidewall flexibility over unforgiving terrain, better ride quality due to increased air volume, and [subsequently] increased traction. The Mesa's faux beadlock ring may be a bit of a turn-off for some, but the feature does provide a bit of protection to the wheel lip and the option to replace if damaged. One difference between the RAM 1500 and 2500+ I had a hard time getting used to was the default seating position height. The seat of the 1500 felt lower than that of the 2500. Personally, I like an upright seating position for ideal driving posture and maximum frontal viewing range. However, I could see the benefit of the 1500’s seating position for long commutes or interstate road tripping. While I'm not ready to trade my beloved 2500 Prospector, AEV’s Recruit proved itself worthy and fully-capable on NMBR’s Gila Legends Expedition route. 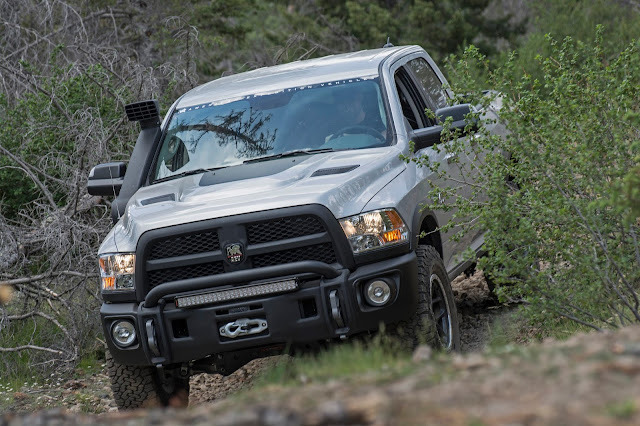 Whereas a RAM 1500 in stock format may have struggled, AEV’s equipment allowed the truck to exceed over a variety of challenging terrain. Did I mention the AEV Recruit completed the majority of the trip hauling a KTM motorcycle in the bed? Capability Versus Weight Capacity -An Overlander's Conundrum: I walked away from my extended test drive of the Recruit with the notion that the American Expedition Vehicles equipped RAM 1500 made sense for adventurists struggling with cramped, and gear-laden compact and mid-sized trucks and sport utility vehicles. Each year I guide and train a multitude of enthusiasts and professionals across the backroads whom drive a variety of four-wheel drive vehicles. Oftentimes, I see where very capable and highly modified Wrangler, 4Runner, and Tacoma models, are nearing or exceeding their gross vehicle weight ratings. While many of these rigs feature dual lockers, 35-inch tires, and host of upgrades, the excess weight is detrimental. Vehicle performance, handling, capability, and fuel economy are negatively impacted. The recent explosion of the adventure-type trailer sales highlights a trend where people have run out of cargo space in (and on) their vehicles. Although adventure trailers provide a simple solution for gear hauling, the vehicle capability and performance ramifications are complex. For comparison, a Jeep Wrangler Unlimited Rubicon’s (or JKUR’s) payload capacity is 1,081-pounds and towing capacity is 3,500-pounds. I’ve guided a number of JKUR drivers on the Gila Legends Expedition route that pulled adventure trailers. All utilized their extra fuel supply for both unsupported sections of the trip as the JKUR’s 22.5-gallon gas tank did not suffice per range. Overall fuel economy varied due to seasonal-specific road conditions, but most obtained less than 10MPG (trip average). Through multiple tight and technical trail sections, the drivers (on average) needed more spotting assistance due to the difficulty of piloting a vehicle/trailer combo through difficult terrain. To put things into perspective, the Recruit’s DualSport suspension retains the RAM 1500’s 1,700-pound payload capacity and 10,370-pound towing capacities. The RAM 1500’s 6’4” bed provides copious cargo area and payload capacity that when paired with a bed rack and roof-top tent or topper, could eliminate all together the need for an adventure trailer. 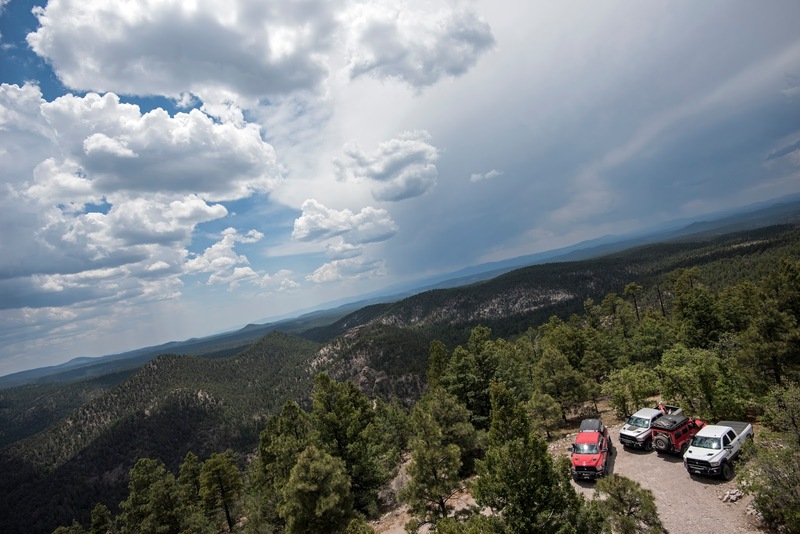 During AEV’s run of the Gila Legends Expedition, the Recruit obtained an average fuel economy of about 10MPG. The Recruit’s fuel economy and 26-gallon tank were just enough to keep from cracking a jerry can on the trail. Keep in mind that a 32-gallon tank is optional for some RAM 1500 models. The difference in fuel economy between the two example vehicles may seem negligible, but the weight capacities (payload and towing) and cargo implications are substantial. While the example JKUR’s had higher ground clearance, increased approach/break-over/departure angles, and some wore 37-inch tires, pulling a trailer significantly decreased their un-hitched capability and fuel economy. The Recruit was able to tackle all of the Gila Legends Expedition’s technical trail sections without more than careful driving and selection of lines—very few multi-point turns and obstacle re-negotiation were needed. AEV Recruit Background: Impressed with the Recruit’s performance along the Gila Legends Expedition route, I reached out to American Expedition Vehicles’ Matt Feldermann, for a detailed overview of the truck. It seems that AEV had once again found the right blend between practicality and performance. During an hour-long Q & A session, Matt explained the development and completion of AEV’s RAM Trucks 1500 based product line. Build with a Purpose: When American Expedition Vehicles evaluates potential product for development, one of the first questions asked is where the idea fits into the fundamentals of what AEV does. For two decades, AEV has been on the cutting-edge of the four-wheel drive industry, constantly pushing the boundaries of design and innovation—"build with purpose”. 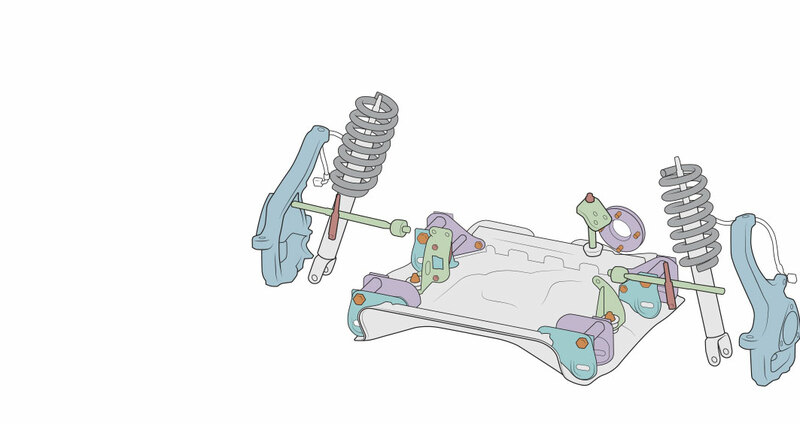 Their products aim to maximize vehicle capability while enhancing OE engineering. American Expedition Vehicles built and equipped Jeep Wranglers and RAM Trucks have been to the farthest reaches of the earth with the short-list reading: Artic Circle, Darian Gap, Dusy Ershim Trail, and Iceland. With half ton truck sales nearly double that of their heavy-duty counter parts, and over a million late-model four-wheel drive RAM 1500’s on the road today, the market is widely untapped with regards to aftermarket (off-pavement) upgrades that support the “work hard, play hard” demographic. These individuals don’t necessarily need a heavy-duty truck, and most don’t even pull a trailer, yet they could not possibly squeeze their outdoor pursuits lifestyle gear and equipment into a four-door Tacoma or Wrangler Unlimited. American Expedition Vehicle’s RAM 1500 parts line has made a relatively attainable and popular platform a very capable one. Ride Quality: Following the “build with purpose” principal, AEV designed the RAM 1500 DualSport suspension from the ground up. Throwing out their traditional engineering approach for solid front axle based suspension, AEV began developing their independent front suspension (IFS) system in 2014. The design team’s goals were simple. Don’t look at what the competition is doing, increase wheel travel, enhance ride quality, and preserve payload capacity. The end result was a four-inch performance based suspension lift that attained (and exceeded) all of the initial design goals. 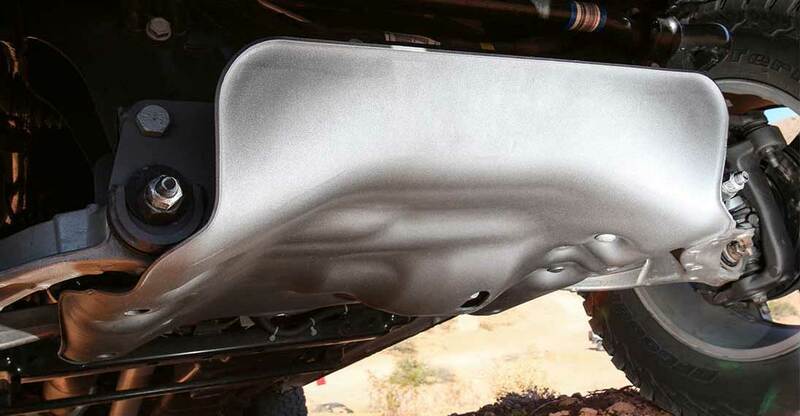 The backbone of AEV’s RAM 1500 system is a 4-mm thick stamp formed steel skid-plate and brace that provides structural support while simultaneously increasing ground clearance. The stamping process AEV uses for skids, bumpers and part production allows for thinner and lighter metal to be used while attaining higher strength than traditional plate fabrication methods. The AEV RAM 1500 skid is precision formed to closely hug and protect the drive and steering components that reside above it. The DualSport suspension is not a long-travel system, but it does maximize wheel travel without overstressing the OE componentry. The CV angles remain unchanged and no additional stress is placed on the steering system. 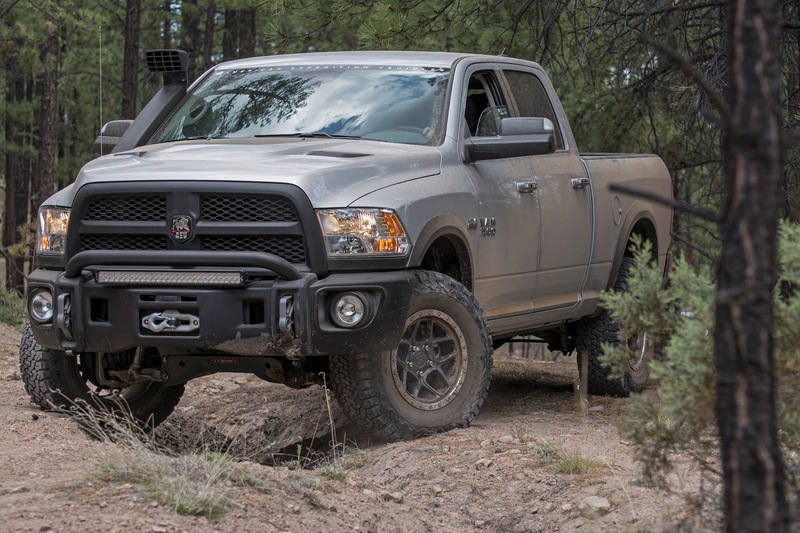 In order to understand the limits of the RAM 1500’s stock componentry, and where improvements could be made, AEV subject the suspension, steering, and drive systems parts severe condition testing and intensive analysis. Innovation that directly resulted from this process included AEV’s steering knuckles. Manufactured out of military grade A206 T4 cast aluminum, the steering knuckles shave 25-pounds of un-sprung weight per side. Following the same principals of the RAM 2500 suspension system, AEV’s 1500 DualSport system maintains the stock coil springs. 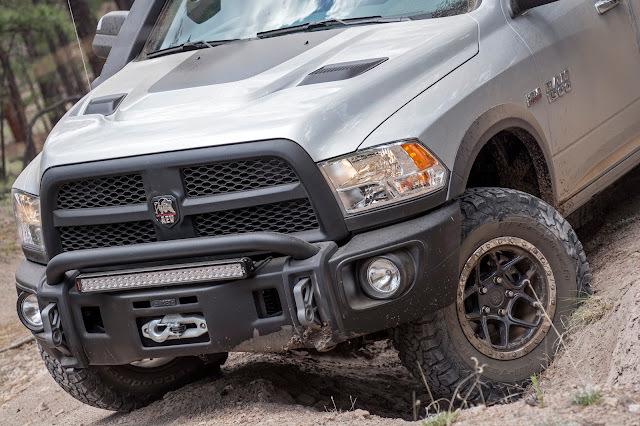 With over a dozen different OE springs offered throughout the RAM 1500 line-up, AEV chose to retain the factory coils at all four corners while providing lift via spacers. The spacers accomplish two tasks; they provide suspension lift height and optimize/preserve steering and suspension angles. The DualSport kit features custom tuned Bilstein 5100 shocks that provide excellent ride characteristics both on and off pavement. The front shocks are height adjustable. This allows users dial in the front lift height regardless of whether they are running a stock bumper, or have installed an aftermarket bumper and winch. At the rear, the DualSport kit optimizes the truck’s suspension geometry through the use of control arm [geometry] correction brackets, raised track bar tower, and custom bent track bar. The DualSport system is designed to provide the truck with a slightly raked stance so that rear sag is minimized when hauling or towing heavy loads. 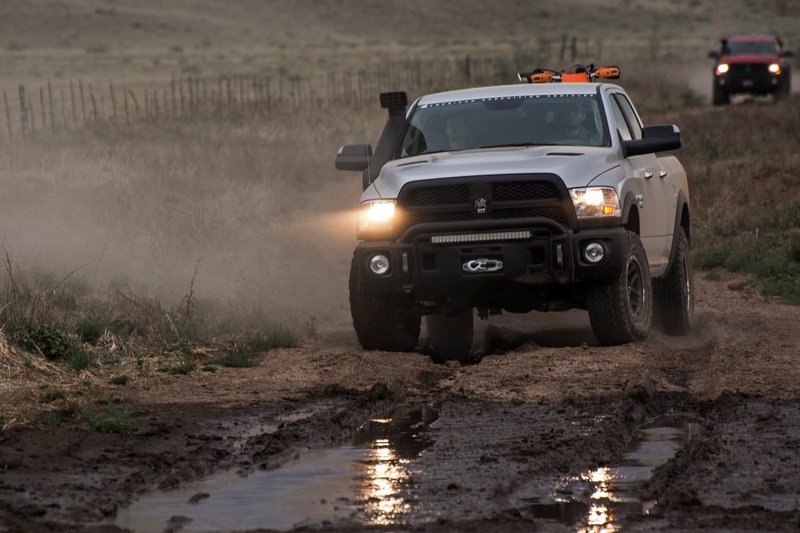 For individuals and companies that lease or frequently replace their trucks, an added benefit of AEV’s RAM 1500 suspension system design is the ability to return the truck to stock without any fabrication or repairs required. The DualSport kit is entirely bolt on and transferable to another compatible RAM 1500. AEV Parts Lineup: Following in the footsteps of the American Expedition Vehicles’ Prospector, the Recruit features many of the same upgrades of its older brother. 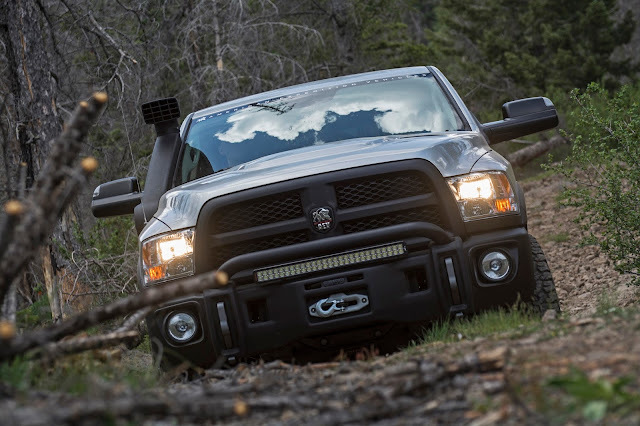 The AEV RAM 1500 stamped steel front bumper features two heavy-duty cast aluminum tow loops, the ability to mount a 10,000-pound winch, and increased ground clearance (approach angle) over stock. While the 1500 bumper looks nearly identical to the heavy-duty version, it weighs slightly less without compromising functionality. 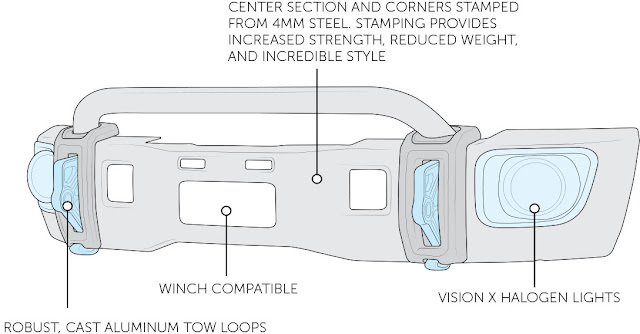 An example of weight shaving on AEV’s 1500 bumper is the use of a lighter winch plate that accommodates a 10,000-pound winch rather that of the heavy-duty bumper that supports a 16,000-pound unit. 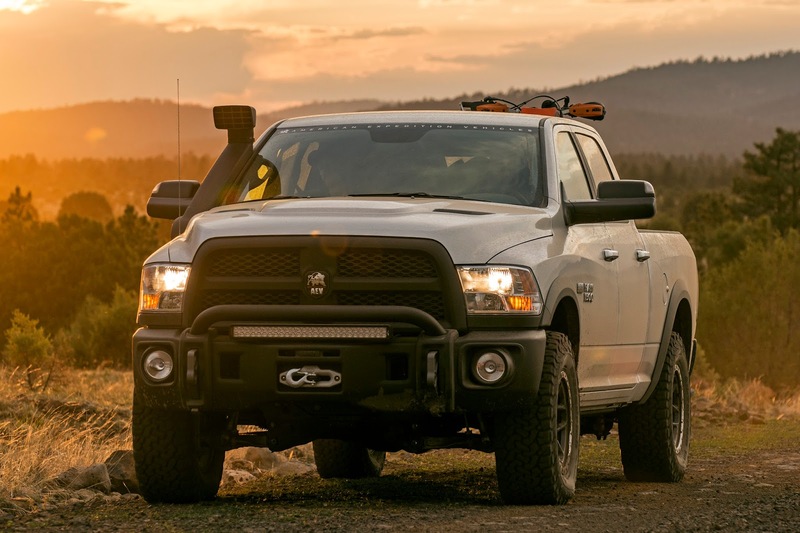 While AEV’s RAM 1500 bumper is compatible with the stock grill and headlights, AEV will offer (as an upgrade) the OE parts necessary to convert the 1500’s frontend into the more masculine heavy-duty 2500+ RAM Truck. The bigger benefit of swapping the 1500’s grill and front trim is the ability to run AEV’s stamped steel heat reduction hood. Aside from aesthetics, the hood’s two vents reduce engine compartment temperatures in driving conditions ranging from idle, to slow going trails, to highway travels. 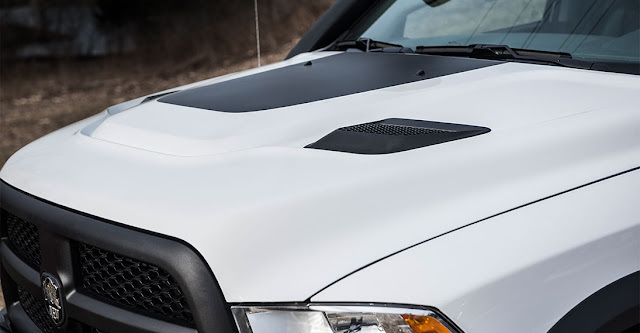 The hood’s vents feature an innovative water channeling gutter system that direct water (entering through the vents) away from vital under-hood electronics and components. American Expedition Vehicles designed the RAM 1500’s raised air intake to provide two major benefits: supply cooler and cleaner air to the engine, and help prevent water ingestion into the engine during high-water crossings. The optional High Efficiency Dust Filtration System air inlet filters and remove up to 98% of airborne particulate prior to air entering the stock air box and filter. The Recruit that tackled the Gila Legends Expedition was outfitted with AEV’s upcoming 18x9-inch wheel, however a 20-inch variant is currently standard for the up fit package. Both wheels feature the optimal backspacing and offset required to run taller/wider tires when paired with AEV’s DualSport suspension. 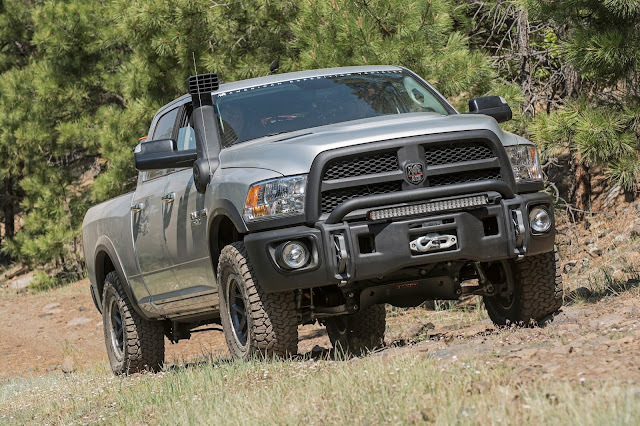 ProCal Module: One of the smallest pieces in American Expedition Vehicles’ RAM parts line-up also provides some of the most substantial benefits. The ProCal Module (designed for all 2013+ RAM 1500, 2500, and 3500 trucks) allows users to unlock a range of programming features. After adding larger tires, the ProCal will correct the speedometer. The speedometer’s accuracy is vital to ensuring OEM specifications for engine performance, transmission shift points, while also maintaining the integrity of the vehicle stability control system. Other ProCal programing options include tire pressure threshold adjustment (cancelling the warning signals the for airing down off-pavement), gear ratio changes (for axle re-gearing purposes), one touch lane change, and high-beam/fog-light combination (for off-pavement night driving). The device is relatively simple to use with a series of in-line dip switches that are set in a specific pattern (based on the accompanying AEV user manual), then plugged into the trucks OBD port, with the acceptance of the program change signified by the horn automatically handing twice. Closing the Chasm: As the weekend warrior demographic requires more power and space for their growing families and gear/equipment intensive recreational pursuits, many are trading in their SUV’s and mid-sized trucks for full-sized offerings. With the release American Expedition Vehicle’s new RAM 1500 based product line, the half-ton platform is attractive and capable as ever.